The recent surge in essential oil popularity is undeniable. A new report published in Green Mountain Outlook projects that the organic essential oil market will continue to see strong growth through 2021. As any aromatherapist will tell you, the safe and appropriate use of essential oils can bring incredible benefits. From encouraging relaxed sleep to headache relief, essential oils are powerful wellness supports. However, there’s a dangerous byproduct to their popularity—a lack of education on safety and proper use. Essential oils are highly concentrated plant substances, and you should treat them with caution and care. To keep yourself and your loved ones safe when using essential oils, take a moment to brush up on these three common and dangerous essential oil mistakes. In an April 2017 Facebook post, an essential oil user shared a hazardous and common mistake you can make with essential oils. She applied essential oils directly to her skin before her yoga class without any carrier oil or dilution (we’ll talk more about that shortly). After her yoga class, she went to a tanning salon in preparation for an upcoming Caribbean trip. As a result of tanning, she developed second and third-degree burns on her arms, wrist, and neck. The burns occurred most likely because she applied photosensitive oils to her skin, and was then exposed to UV light from the tanning bed. Photosensitive, or phototoxic, essential oils (a few are listed below) usually contain furocoumarins, which can cause severe burns and increase your skin cancer risk when your skin is exposed to UV light or sunlight. If you know you'll be in the sun, avoid them in products that are designed to stay on the skin, like body lotions or creams. For DIY products, make sure that the use level in a leave-on-the skin product is within the recommended maximum dilution percentage level required by the International Fragrance Association (IFRA). If there are blends of phototoxic essential oils in your leave-on-the skin products, reduce the percentage as needed. There are no restrictions for rinse-off products, so a shower gel or liquid body wash is not as risky. To learn more, you can download the standards from the IFRA website, and stay tuned for an upcoming blog post on photosensitivity! It’s interesting to note that expressed citrus essential oils—not steam distilled citrus oils—cause photosensitivity. Furocoumarins are large molecules that do not evaporate, and consequently, they do not transfer over through steam during the distillation process, but they do transfer over with expression. Most essential oil bottles will state whether your oil is expressed or steam distilled. Not sure if your oil is expressed or distilled? Play it safe by avoiding direct sunlight or UV light after applying. Also note: absolutes or carbon dioxide extracts (CO2 extracts) will most likely be phototoxic as the extraction process brings over heavier, more complex molecules like furocoumarins. You can use essential oils in many ways. They can be applied directly to the skin, inhaled, or taken internally. Each application method has its own precautions. Irritation from an essential oil is a direct result of contact with the oil. It’s localized and does not involve the immune system. Once the offending essential oil is removed using a base oil or full-fat milk (or at least 2%), the skin can begin to recover. You can even use tepid water in a pinch, but it’s not as effective as oil or milk. For people with sensitive skin, essential oils can sometimes cause more damage, while other folks can withstand the same concentration of essential oil without a problem. 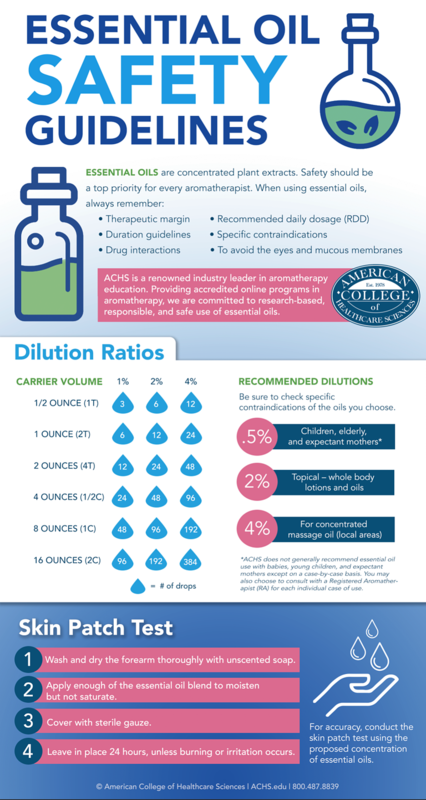 There are three important factors when considering essential oil applications: dilution ratio, recommended daily dosage, and duration guidelines. When in doubt, conduct a skin patch test as demonstrated in the infographic below and this video with Dorene Petersen. Inhalation is arguably the safest means of administering essential oils, and it’s the fastest way to get essential oils into your bloodstream. However, it’s still critical to use oils with caution… even when diffusing. While only a few specific essential oils are suitable for oral administration, this doesn’t apply to all essential oils, nor do all situations call for oral application. It’s important to ask yourself if oral administration is actually necessary. Each client is a unique individual with a specific situation, which must be analyzed and critically assessed. Toxicity or poisoning is often the result of using a dose much higher than the therapeutic dose or recommended daily dose (RDD). The Martindale Extra Pharmacopoeia provides excellent guidelines for using essential oils orally and notes acceptable daily intakes per kilo of body weight. Tea tree Melaleuca alternifolia (Cheel) and eucalyptus Eucalyptus spp. are two common culprits for poisoning. This typically occurs when someone has ingested too much or a child drinks the oil in error. Always keep your oils out of reach of children. We even suggest purchasing childproofed essential oil lids and a child lock for your essential oil cabinet. Bottom line: oral administration is best left to those who are trained and have experience in clinical aromatherapy. However, some essential oils are delightful when used in cooking. Curious to explore? We have a free eBook on the subject: Top 10 Culinary Essential Oils. But remember, after checking the cautions and contraindications for your oil of choice, dilute thoroughly with a carrier oil like olive or coconut oil. You can also check the U.S. Food and Drug Administration Generally Recognized as Safe list (GRAS) for oils that can be used in very minimal amounts in cooking. Additionally, when available, it’s always best to use certified organic essential oils. Ignorance or disregard of basic essential oil safety information can be one of the most dangerous mistakes to make with essential oils. Essential oils can react with prescription drugs and supplements (a topic for another blog post), and they can cause adverse reactions when used in excess. They can react differently in children, the elderly, and those with weakened immunity. It’s imperative to educate yourself on the cautions and contraindications surrounding essential oils. For example, anise Pimpinella anisum (L.) essential oil contains the toxic constituents anethole and phenolic ether. When used in excessive doses (more than three drops, three times per day, or with prolonged use over two to three weeks), anise has the potential to cause circulatory and nervous system disorders. Also, a 2012 review study showed that anise P. anisum essential oil increases the effects of drugs that affect the central nervous system (CNS). It also showed anise lowered the antidepressant effect of some medication. Another example is fir Abies balsamea (L.), which has been shown to potentially inhibit certain metabolic pathways in the liver, which could potentially limit the effectiveness of some diabetes medication. Enjoying aromatherapy safely should not be based in fear but in education. Essential oils can enhance and enrich your wellness practice. But, like all things in life, the more you are educated about what you’re using, the better your outcomes will be. Samojlik, I., Mijatović, V., Petković, S., Skrbić, B., & Božin, B. (2012). The influence of essential oil of aniseed (Pimpinella anisum, L.) on drug effects on the central nervous system. Fitoterapia, 83(8):1466-73. Tam, T.W., Liu, R., Arnason, J.T., Krantis, A., Staines, W.A., Haddad, P.S., et al. (2011). Cree antidiabetic plant extracts display mechanism-based inactivation of CYP3A4. Can J Physiol Pharmacol., 89(1):13-23. doi: 10.1139/y10-104.